Italy’s parliament recently took another step forward in its efforts to halt organ trafficking in China. On July 31, eight members of parliament from the Five Star Movement party proposed a resolution aimed at fighting illegal organ trade in China, and called for the release of all prisoners of conscience, including practitioners of Falun Gong. The resolution requests that Italian diplomatic representatives avoid hosting conferences and meetings about organ transplants in countries that do not respect international conventions, and to reconsider the training of Chinese doctors in transplant techniques in Italian hospitals. It also asks the Italian government to reconsider the Italy-China joint research programs on transplant medicine. “I received a recommendation from Doctors Against Forced Organ Harvesting, and I thought it was appropriate to register this resolution so that Italy could help in this ,” said Emanuele Scagliusi, the first signer of the resolution and vice president on the Senate Committee on Human Rights for Italy’s Chamber of Deputies. Doctors Against Forced Organ Harvesting (DAFOH) is a medical ethics advocacy group that seeks to raise awareness about illegal organ transplantation. The Justice Commission of Italian Chamber of Deputies is due to discuss the resolution in the fall. “We’re pressing for it to be approved as soon as possible,” Scagliusi said. “The resolution would help to avoid Italian complicity” in China’s organ abuse, wrote renowned international human rights lawyer David Matas in an email. “The resolution, on its own, can not solve this problem. But it is a step in the right direction,” he added. In 2006, Matas and former Canadian member of parliament David Kilgour were the first to investigate allegations of organ harvesting from Falun Gong practitioners in China. Falun Gong is a traditional Chinese meditation practice that has been persecuted in China since July 1999. Italian MPs have earlier taken measures to curtail organ transplant abuse in the country. In March 2014, the Human Rights Committee of the Italian Senate approved a resolution against forced organ harvesting. This March, the Senate approved a bill that strictly punishes those who engage in trading organs harvested from living persons. Those found guilty face up to 12 years in jail, and fines ranging from 50,000 to 300,000 euros (about $54,600 to $327,660). China’s organ transplant czar and former deputy health minister Huang Jiefu said during a press conference in Hong Kong on July 21 that over 12,000 organ transplants will take place in China this year from a waiting list of more than 30,000 people, a “thought provoking” statement because China doesn’t follow international standards on organ donation, wrote DAFOH executive director Torsten Trey by email. “Many organs entered in this system are procured through hospital staff who go to death bed patients, offering their families monetary incentives worth a year’s salary. This practice violates the World Health Organization’s guiding principles, which prohibits financial incentives in exchange for organ donations,” Trey wrote. “Secondly, if people voluntarily register as organ donors, they usually don’t pass away within 1 or 2 years. Thus, explaining 12,000 transplant operations with a public organ donation system that is only 3 to 4 years old is suspicious: it suggests that the Chinese organ donation system is based on coercion,” he added. In fact, while the Chinese regime said it would end the practice of harvesting organs from executed prisoners in January, it hasn’t passed a law to enforce this promise, Trey said. Until the day prisoners of conscience, like Falun Gong, are not persecuted by the Chinese regime, it is highly likely that these ostracized groups will continue to serve as a source of organs, he added. Researchers of organ harvesting like David Matas, David Kilgour, and investigative journalist Ethan Gutmann have gathered evidence that public and military hospitals in China are engaging in the killing of mainly Falun Gong and other prisoners of conscience, and removing their organs to sell for a profit to buyers in China and abroad. Several hospital doctors and staff have openly acknowledged to anonymous callers on Matas and Kilgour’s research team that they have a ready supply of organs from Falun Gong practitioners, and chillingly vouch for their quality. In “The Slaughter,” Gutmann’s book on organ harvesting that was published earlier in the year, he documents similar accounts from Falun Gong practitioners being forced to undergo blood testing when they are held in labor camps or prisons. Matas and Kilgour estimate about 40,000 Falun Gong practitioners have lost their lives due to organ harvesting, and Gutmann puts the number at 65,000. All three agree that the actual numbers could be much higher. Italy is not the only country that is trying to halt organ trafficking. Taiwan’s parliament, the Legislative Yuan, passed an amendment to their organ transplantation laws on June 12 which makes patients who seek organ transplants abroad and the doctors who recommend them be held accountable to the organs they receive, particularly if they come via illegal means. 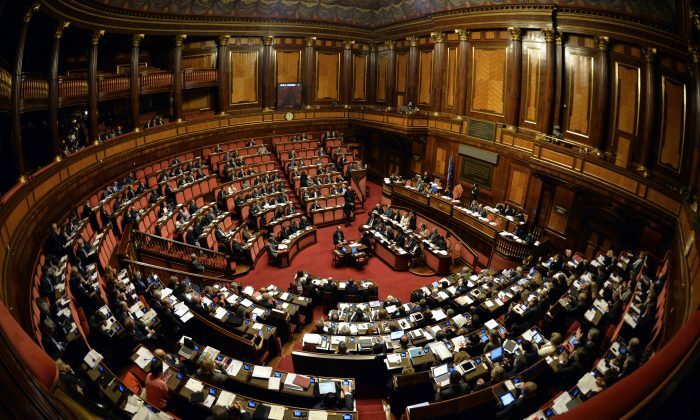 The Italian Senate has approved a bill, with China in mind, that would introduce harsh penalties against individuals who knowingly traffic in human organs. A new voice, from an unexpected quarter, demands answers.